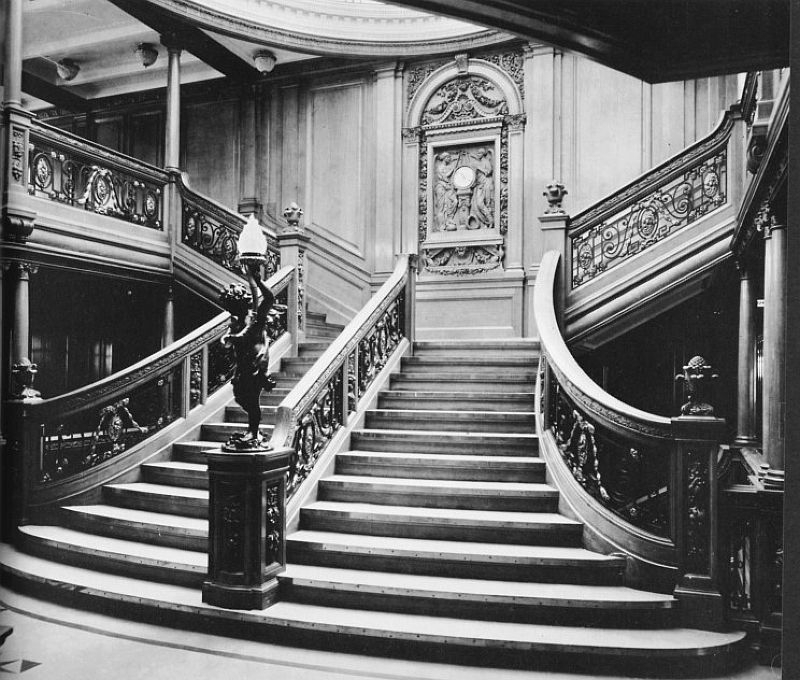 The luxurious staircase that formed a quintessential part of every elite 20th Century ocean liner was a profound showcase for the outfits of fashionable patrons. The V&A recreated this event in its exhibition Ocean Liners: Speed and Style with a projection of figures descending a mockup staircase in replica 1920s couture eveningwear. For many passengers the highlight of each day at sea was the theatrical descent from the upper decks into the dining room where they could see and be seen in their most elegant eveningwear. Who could forget perhaps the most memorable depiction of the grande descente of an ocean liner in popular culture in James Cameron’s Titanic when Rose steps down like an angel to the awaiting Jack Dawson. Indeed the staircase forms a constant motif throughout the film, from the luxurious opening to the horror as water bursts through the glass ceiling, and finally the heavenly dream when Rose posthumously returns to Jack waiting by the clock. In the V&A’s exhibition an elaborate plaque that would have held a similar clock from the Titanic’s sister ship the Olympic is proudly displayed with an array of Edwardian interior pieces. In one French screen of dark wood there is a constant homage to the grandeur of Versailles with Louis XIV’s sun motif depicted throughout.